Reading patterns in unfolding political events now comes naturally to Kashmiris grappling with the unabated turmoil. So this past Eid when the Hizb supremo Syed Salahuddin emulated the Hurriyat Conference by announcing a week-long protest calendar to mark the first death anniversary of the former Hizb Commander Burhan Wani, Washington declared him a “global terrorist”. But even a shopfront regular in Srinagar dismissed the move on the expected lines of keeping the visiting prime minister of India in “good humour”. It happened hours before the scheduled Modi-Trump meeting and apparently left nothing unsaid for the Kashmiris in the backdrop of Washington’s whopping weapon deal with New Delhi. For this trade factor, Uncle Sam – seen as the “wicked godfather” by a majority of Kashmiris – and his latest move is being scoffed at on the ground. That “America cannot decide matters for us” has suddenly become a populist catchphrase in the restive region. But in the din of the studio shrill emanating from Delhi, this side of Kashmir hardly makes it to prime time shows. And therefore what is read as the diplomatic “triumph” by the South Block and its Lutyens’ media is clearly seen as the smart trade move by the shrewd capitalist now gracing the White House as president. The move also appears to be a balancing act in Indo-Pak relations. Amid all this, Salahuddin, 71, continues to wield a celebrated “freedom fighter” sway in the Valley. By designating the same man as a Specially Designated Global Terrorist (SDGT) for his September 2016 statement in which he had vowed to “turn the Kashmir valley into a graveyard for Indian forces”, the America has only made him a global figure whose campaign is otherwise confined to Kashmir. There was/is nothing global about his fight for the “righteous cause” in Valley. The action bars US persons from financial dealings with Salahuddin, otherwise having no reported transactions and properties abroad. “By only pinpointing him as a person, the US State Department has spared Hizb or UJC from designating as a terrorist organisation,” the scribe said. A different time, a different person? 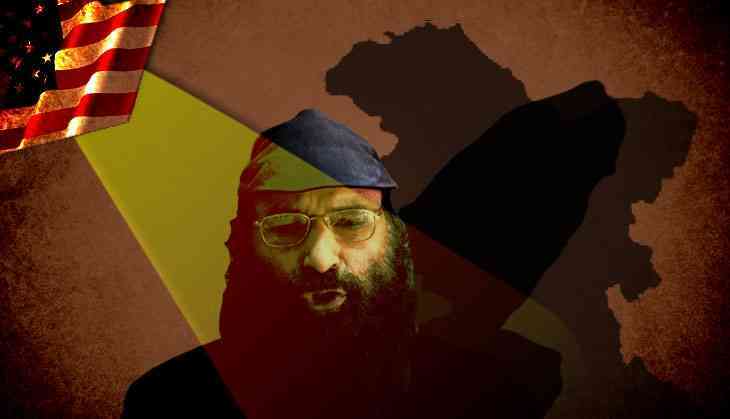 In Srinagar, however, Salahuddin's comrades of yore turned surrendered militants recall him as a gentleman who had once pinned hopes on 'Indian democracy' in Kashmir. “He always wanted Delhi to fulfil the promise of plebiscite made by its first prime minister Pandit Jawahar Lal Nehru to Kashmiris,” said Mushtaq, a former Hizb militant who had campaigned for Salahuddin in 1987. In Kashmir’s chequered history, the year 1987 is a considered as the watershed event. That year, Syed Salahuddin was still Mohammad Yusuf Shah, a fiery cleric known for his religious devotion in Srinagar circles. Coming from Budgam, where recently Major Gogoi triggered a controversy by using a Kashmiri weaver as a human shield, Salahuddin is the seventh child of middle-class parents. He rose to become a Jamaat-e-Islami ideologue and taught in a seminary. All this happened before 1987 when he decided to contest Assembly elections as the Muslim United Front (MUF) candidate. That newly floated party was seen 'a clear winner' in some Assembly segments by the Congress that had for the first time entered into seat-sharing accord with National Conference then. And therefore the party, according to AM Watali the then Kashmir police chief, orchestrated the rigging, especially at Amira Kadal, wherefrom Shah was contesting and winning. But what shocked many was the manner in which Shah was dragged from the polling booth and detained along with his polling agents, including Jammu and Kashmir Liberation Front (JKLF) chief Muhammad Yasin Malik. Days before his detention, he was given a rousing reception by thousands in a Srinagar park where he turned up wearing a shroud and was guarded by a rifle-borne youth named Aijaz Dar – who later became the first official casualty of militancy. That reception spoke of his stature as a leader. Two years later, Yusuf Shah stepped out as a changed man from the detention. He no longer pinned his hopes on Indian democracy and its institutions in Kashmir. As militancy against Indian rule in the Valley began by the late eighties, he decided to settle matters with a gun. He joined the pro-Pakistan militant outfit Hizbul Mujahideen and soon rose to become its chief. Once a civil servant aspirant was now the 'Big Daddy' of Kashmir militancy, going by his nom de guerre Syed Salahuddin – the name inspired from the 12th century legendary Muslim military commander, Saladin who fought in the Crusades. Since then, he has been heading an alliance of militant groups, the United Jihad Council. His group has already reiterated that the Kashmir struggle is an “indigenous freedom struggle and not a terrorist movement”. For this reason, he continues to yield sympathies for himself in Valley – although, he is being equally castigated, especially by the local unionist camp for his militant methods to engage with the Indian state in Kashmir. “He wants peace,” said Javaid Mir, a separatist leader and Salahuddin's polling agent in 1987. In that case, it would be interesting to see, how the US will deal with him. But Delhi’s response toward him was always that of an archenemy. His name has been already tagged in the list of 20 “most wanted people” and figures on the NIA’s most wanted list, too. According to his former comrades turned surrendered militants, he may have a gun in his hand, but so far he hasn’t even fired a single bullet. In fact, after 2010, when the young boys led by Burhan Wani revived the beleaguered Hizb, Salahuddin assumed a much-relaxed role of the patron who “confined himself to statements only”. “It isn’t gun of Salahuddin,but an unbending attitude of Kashmir’s fourth generation that has resulted in the historic low poll percentage in recent Srinagar parliamentary elections. That was a clear message to Delhi as who’s what in Kashmir now,” said Azam Inquilabi, an ex-militant commander. It is also another fact how even Lashkar chief Hafiz Syed’s posters outnumbered his virtual presence in various dissent rallies across the Valley recently after the former was designated as “global terrorist”. Now, branding an otherwise unruffled Pir (holy man) – as Salahuddin is known among his followers – as a 'global terrorist' is likely to surge support for him on ground. For this, one cannot rule out the vintage American move to cut the military size of Beijing in the region despite Trump looking to China to rein in North Korea. In this “Trump-Modi nexus”, India has been pitted more against China, putting Pakistan closer to the China-Russia bloc. Already backed by Pakistan, Salahuddin is also likely to be vetoed by Islamabad’s “all-weather friend” China. China has already vetoed the “UN designated terrorist” Masood Azhar. “International relations might be beyond the knowledge of an ordinary man,” says Er Rasheed, a firebrand lawmaker from Kashmir who endorsed dialogue with Salahuddin many times in the J&K Assembly. But the tag has now put the 'son of the soil' on par with other “global terrorists” like Hafiz Syed and Masood Azhar. But such terrorist tags hardly ruffle feathers in Kashmir, where the majority realises how even Subhas Chandra Bose and Bhagat Singh were called 'terrorists' during India’s freedom struggle. And since the “global terrorist” tag is being reviewed every year, many say, the brand won’t last long. Last time, the US had designated Hizb Islami chief Gulbuddin Hekmatyar with the tag. But when the Afghan warlord made a comeback to Kabul recently – that too as “American peace emissary”, the tag itself became a joke. The author is a Srinagar-based journalist.